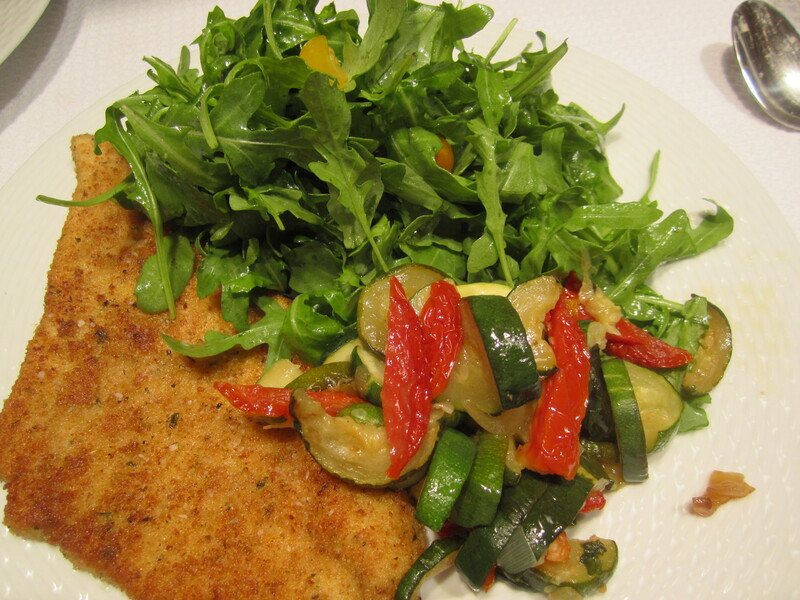 Although I’m not a big consumer of takeout, last week at my local gourmet market, I noticed ‘Swordfish Milanese,’ which peeked my interest–they were broad, breaded pounded paillards of swordfish that looked crispy and golden. They turned out to be not only crispy on the outside, but extremely tender on the inside–much more tender than chicken, veal or pork. 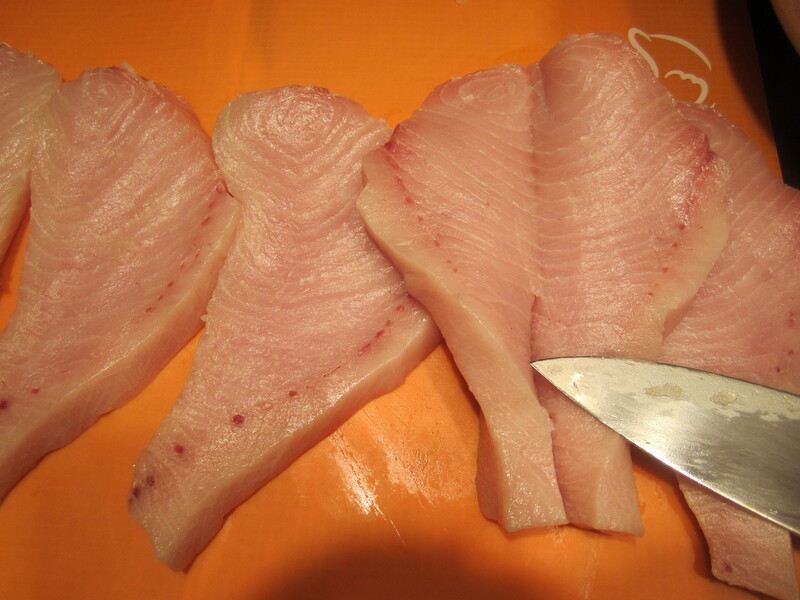 And because the fish was so fresh, it had hardly a hint of fishy flavor. After trying one, I decided to recreate the dish in my kitchen. I used seasoned breadcrumbs, to which I added a bunch of freshly chopped parsley. The rest of the preparation was the usual flour, egg, crumb sequence, then pan-fry in a combination of butter and olive oil. I added the butter to accelerate the browning, since fish cooks much more quickly than meat, and butter browns (and burns) more quickly. 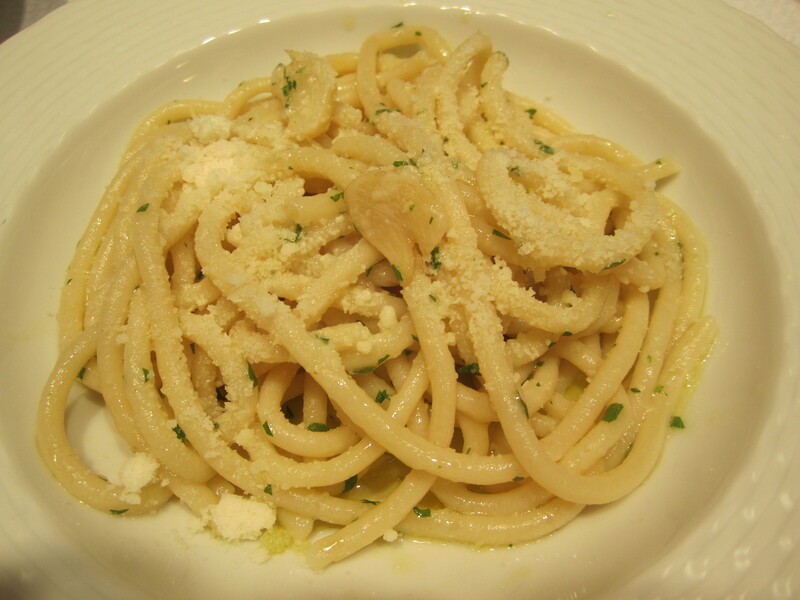 For a first course, we had pici (fat spaghetti) with garlic and olive oil. I had garlic from the farmers’ market which was exceptionally fresh and sweet–critical to this dish. 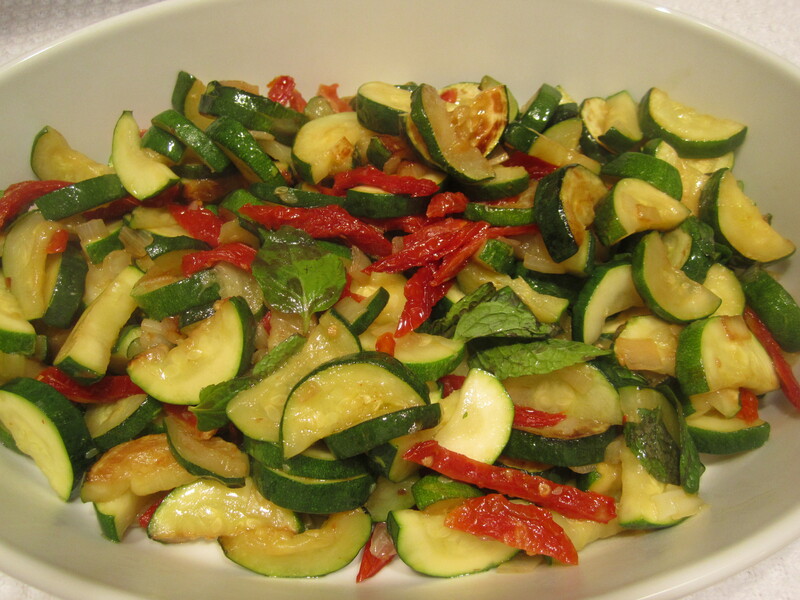 To go with the fish, along with a nice pile of arugula dressed with lemon and olive oil, I made sauteed zucchini with shallots, sundried tomatoes and mint. I had bought the tomatoes several weeks ago at the farmers’ market and they were exceptionally moist and red–no need to re-hydrate them in warm water. Butterfly the fish to make 1/2 thick slabs. 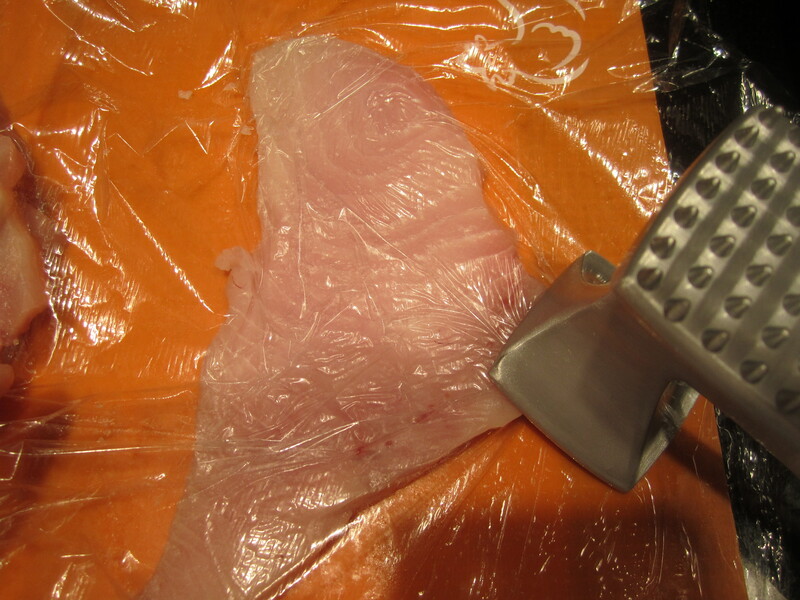 With a meat pounder, pound slightly to spread–not too forceful or they’ll shred. Dip in flour, shake to remove excess; then beaten eggs, let excess egg drip off for a few seconds; then breadcrumbs, being careful to press the crumbs into the fish. Set aside. 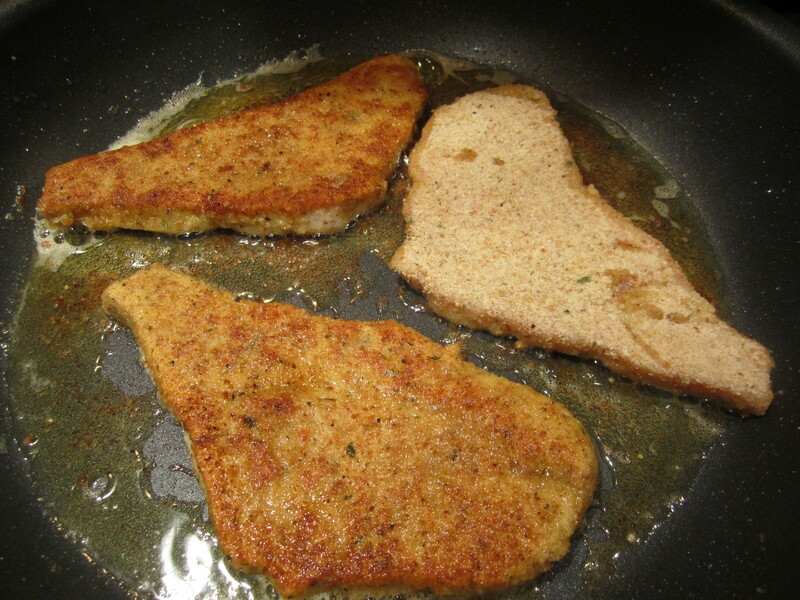 On high heat, in hot oil and butter, gently place the filets and allow to brown, undisturbed until golden brown on the bottom. Flip and brown the other side for about 2 minutes, or until brown. May be held at this point in a 250-degree oven until ready to serve. Great leftovers, eaten cold from the fridge (never reheat–they become fishy).